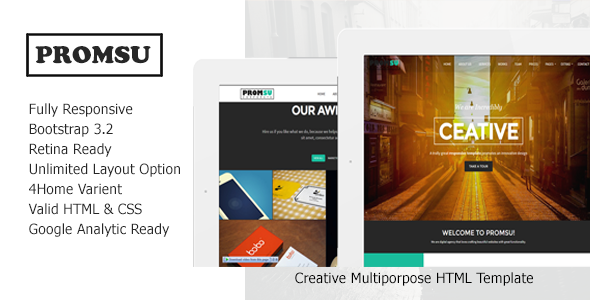 Promsu is a fully responsive and parallax one page template. This is powered with Twitter Bootstrap 3.2 Framework. It is clean and professional theme perfect for any creative agencies, freelancers and studios. It can be customized easily to suit your wishes. It comes with the essentials you need to show your work / portfolio and sell your services to the world. Unlimited layout possibility to use the rich styling option. Item Reviewed: Promsu New Creative Multipurpose HTML5 Template 9 out of 10 based on 10 ratings. 9 user reviews.